This is, err, not going to be super in-depth. If we're being honest here, I've already forgotten 99% of what happened in that match. Who'd we play again, anyway? 1. I didn't get to the pub until about 10 minutes into the first half - enough to miss Olivier Giroud's wonderful scissors-volley that smashed against the crossbar at any rate - and then was distracted for much of the second half, as well. In other words, I'm not going to have much in the way of in-depth analysis this time around. Thing is, an old mate from the Nevada's days and on through until a year or two ago was back up around these parts from North Carolina, and he happened to pop into O'Hanlon's to see if anyone was around. Truth be told, I missed large swathes of the second half catching up with him, meeting his new fiancee, etc. It's a bit cliche to say it perhaps, but it is a reminder that some things are more important than a game of football. Having been in and around the Arsenal NYC setup since the beginning (and before that, to be fair), I can say with confidence that the friends that I've made and the moments shared with them far, far, far outweigh what happens in any one given game. 2. That said, what a starting XI this was, eh? If we thought the Koln game was darts-at-a-dartboard, this was more throwing the names of the squad into a blender and hitting "puree". 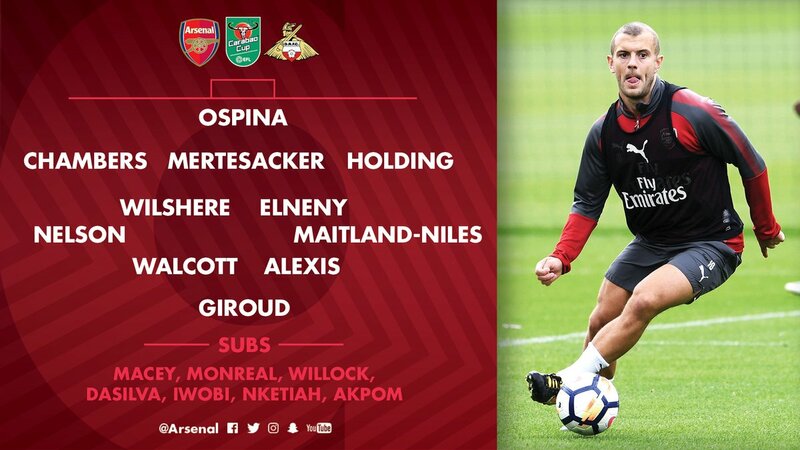 I literally had no idea that Calum Chambers played in this one, though unfortunately for him this is the last we'll see of him in a while, as he aggravated an injury somewhere in this one. Meanwhile, Rob Holding got though this one without calamity, as did David Ospina. Meanwhile, those clamoring for Reiss Nelson to be more involved were granted their wish, though he didn't make much of an impact on the proceedings. There'll be better days for him, I'm sure. The main headline, though, is that Jack Wilshere made it through 90 minutes and looked generally pretty good in doing so. He's been remarkably patient in waiting for his chance, especially given that even his loan spell at Bournemouth last season wasn't especially fruitful for him. There's still the makings of a truly great player in there, and it's not like our central midfield positions are locked in by players in mega-awesome form. All he can do is take his chances while they come, and you have to think this one was mission accomplished. Consistency is now going to be the key for him. 3. On the other hand, Alexis playing in this thing was more than a little weird, especially as he's only been a sub in the Premier League games. The journos are already having a field day with this whole thing, too. Typically, when Arsene goes to great pains to say that Thing X isn't true, then usually it means Thing X is *absolutely* the case. If so, honestly, I'm not as bothered about it as you might think I'd be. Competing on all fronts is going to be difficult in any case for us, but even assuming this is only a temporary demotion, the Chelsea match showed that some of our depth players are better than the more hysterical of us have given them credit for. And, if it means we have a world-class player to help us through the early rounds of the cups, then even better. Really, the main goal was keeping him out of the clutches of an already-rampant Manchester City, anyway. 4. The first half was largely tolerable, and the goal was well-taken once it happened. Alexis crossed one in to Theo Walcott on the back post, who then dribbled past a few dudes and dinked it over the onrushing keeper. Easy peasy. Watching their # 8 go utterly into screensaver mode was especially enjoyable. Poor lad's brain was broken. But, and maybe I'm wrong here, we didn't really create a whole hell of a lot else against a club struggling in League One, and that was honestly kind of annoying. If the first half was annoying, the second was downright problematic. 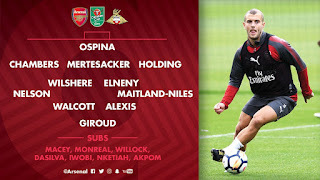 I know we ended up throwing on Alex Iwobi and Chris Willock at one point, but I don't think either managed to pull up any trees, to put it diplomatically. Meanwhile, they saw a lot more of the ball, and I did see one bit where one of their lads either hit the crossbar, or Ospina had to tip it onto there. My god, can you imagine the Twitter meltdown if this thing had to go to extra time? It's bizarre how seriously they're taking this, aren't they? 5. It wasn't pretty, it wasn't fun to watch, but we're through to the next round of the League Cup and we gave some players some minutes. I think we learned that Jack is starting to get more ready for prime time, whereas perhaps Nelson might need a bit more seasoning first. Other than that, don't sweat this one. It's the League Cup, and if the other big teams want to throw strong lineups at it, that's their prerogative. Us, we'll take three points on Monday against West Brom and then worry about bigger things as they come. That's all.